The only crime of expat life is to set one's sights too low, says Alan Paul whose book Big in China is now eyeing the silver screen. Kelly Chung Dawson reports. 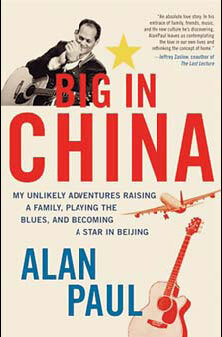 Drawn from his award-winning column "The Expat Life" for The Wall Street Journal blog, Alan Paul's new book Big in China details his family's move to Beijing, the struggle to experience life outside the "expat bubble", and Paul's unlikely success as the lead singer and guitarist of a blues band during his three-and-a-half years in China. Two years after his return to the United States, Big in China (released in 2011), is in the reckoning for a film by Montecito Pictures, a major production company associated with Paramount Studios. When Paul's wife Rebecca was offered a position as The Wall Street Journal's China Bureau Chief in 2005, Paul, Rebecca and their three young children (Anna, 21 months, Eli, 4, and Jacob, 7) were uprooted from New Jersey's suburbs and set about making a home in a foreign country, where reinvention, Paul soon came to realize, was the norm. "In that environment, remaking yourself - just hitting the reset button and starting over - seemed like the most natural thing in the world," Paul writes of Beijing. "It was happening all around me; there was the journalist running restaurants and bars; the doctor with a thriving export business Anything felt possible, and the only crime was setting your sights too low." Nowhere is the potential for reinvention made clearer than in Paul's account of his rise to success as the front man for "Woodie Alan", the eponymously named band he formed with lead guitarist Woodie Mengke Wu after a chance encounter. Before moving to China, Paul had only casually dabbled with music, although his job as a journalist for Guitar World had long provided an outlet for his love of music. Backed by Lu Wei on drums, Zhang Yong on bass and Dave Loevinger on alto sax, the group ultimately went on to win City Weekend's "Band of the Year" award in 2008 and toured several Chinese cities. "'Chinese blues band' sounds like a punch line, but it was no joke and neither were my wonderful band mates," Paul says. "Having said that, I think China can be a really funny place but when people write about it, they get so serious. My book is a little more light-hearted, even when tackling serious issues. That's how life should be, in my estimation." 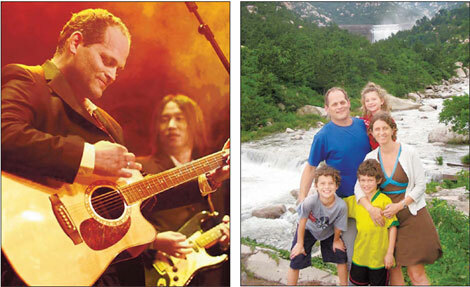 Recording everything during his years in Beijing in posts for his online column "The Expat Life", Paul and his family encountered all of the pleasantries and pitfalls of expat existence. Back home in the United States, family members and friends watched the story unfold. "Something is happening to you," one family member wrote to Paul. "I can feel it pulsing through your writing, and it's exciting." For Paul, writing about his experiences pushed him to seek further adventure. "This was key because sitting around [expat] compounds is a fatal mistake for a newly arrived expat," he writes. "In the middle of the day, they become an ocean of ennui in the middle of a vibrant city." 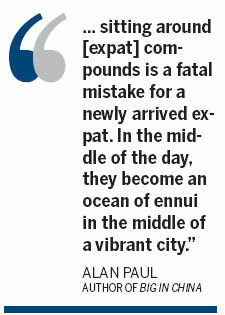 Many inhabitants of what Paul deems "Expat Land" make no attempt to push beyond its carefully manicured boundaries, which can make for a strange (but cushy) existence, he says. "It was great But in some ways it just wasn't China," he says of expat life. "I viewed it as a small window and wanted to make the most of it and really experience the country, its people, its food and its culture." Paul also writes about "The Third Culture", a term coined in the 1950s by sociologist Ruth Hill Useem to describe the experience of "someone who has spent a significant period of time in one or more culture(s) other than his or her own, thus integrating elements of those cultures and their own birth culture, into a third culture." Paul's children experienced the Third Culture as it is traditionally understood, but through his description of a friendship with Chinese tutor Yechen, Paul seems to argue that adults and Chinese people can have the same experience. Yechen felt out of step with the modern Chinese existence, attempting to reconnect with an ancient style of Chinese life through monkhood and ultimately failing. "I saw the connections between us and the similarities between how we had both found ourselves and our places in the world by leaving our home cultures," Paul says. "It is possible to have the Third Culture experience anywhere." Some of Paul's readers weren't sure what to make of his new life in China, which to people back home read like a departure from reality. "Few Westerners seemed to even know that guys like my band mates existed, because they were outside the normal China narrative," Paul writes in the book. "From the beginning to the end of my experiences in China I was amazed and confounded by two broad stereotypes of China held by Westerners - because they were polar opposites," he says. "There were people who thought everyone in China was living in urban hutong or grass huts next to rice paddies, and there were people who thought China was a raging dragon getting ready to gobble us up. So many people in the US seem scared of China now, and it trickles down to how they feel about the people." Stereotypes about China motivated Paul to continue writing, and ultimately upon his return to the US in 2009 he began putting together Big in China in hopes of synthesizing some of the larger themes of his time abroad, he says. "I hope that my book helps break that down a little bit," he says of common American misperceptions about China. "I really believe that there are a lot more similarities between the countries and the people than most understand," he says. If a film is indeed made about Paul's time in China, he hopes it will accomplish some of those same goals of promoting cultural understanding. He chose Montecito Pictures because he was confident that they would stay true to the message of his book. "Great things can happen to anyone anywhere in the world if they have their eyes and ears open and are willing to take some chances," he says of the entire experience. Paul is still regularly in touch with his band mates. He looks forward to getting on stage with them again soon.